Everything you need to clean and protect your fabric convertible top! You’ve never carelessly left one wheel dirty when you detail your car so why neglect your convertible top? Your vehicle’s convertible top doesn’t need quite as much attention as the rest of your vehicle when you clean and protect it regularly with RaggTopp Convertible Top Care Products. It’s never too soon or too late to start cleaning and protecting your convertible top the right way. If your fabric top isn’t producing tight water beads like your freshly waxed paint, then it’s time to protect it with RaggTopp Convertible Top Care Products – more specifically the RaggTopp Fabric Convertible Top Cleaner & Protecant Kit! 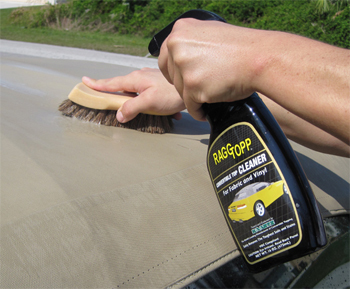 Whether your convertible top is new or old, the RaggTopp Fabric Convertible Top Cleaner & Protectant Kit is an all-inclusive kit that includes everything you need to clean and protect it. RaggTopp Convertible Top Care Products apply as effortlessly as your favorite carnauba wax and they’re sure to provide long-lasting protection so your convertible top looks and performs like new for years. What’s more, RaggTopp Convertible Top Care Products are endorsed by Haartz, the leading manufacturer of convertible tops. Use confidently to safely clean convertible tops, sport utility tops, simcon tops and tonneau covers. RaggTopp Cleaner removes the toughest roof soils and stains, retards the growth of mildrew and will actually keep dirt and grease at bay. The anti-oxidant, low pH, no bleach formula leaves NO residue. The environmentally friendly & biodegradable formula will not harm automotive finishes, chrome, rubber, glass, or plastic windows. The RaggTopp Natural Horse Hair Convertible Top Brush is packed with thousands of genuine horse hair bristles that gently clean vinyl and fabric convertible tops. The soft bristles loosen soil for more effective cleaning. Give your vehicle’s convertible top the best care with the RaggTopp Natural Horse Hair Convertible Top Brush! Use these super soft microfiber towels to remove the protectant off unwanted surfaces such as paint and glass. The fibers are non-abrasive, and are woven so tightly that it’s absolutely lint free and extremely durable. Unbelievably, these ultra-tough fibers are engineered to absorb seven times their weight in moisture. A total retail value of $61.95. You save $11.96! 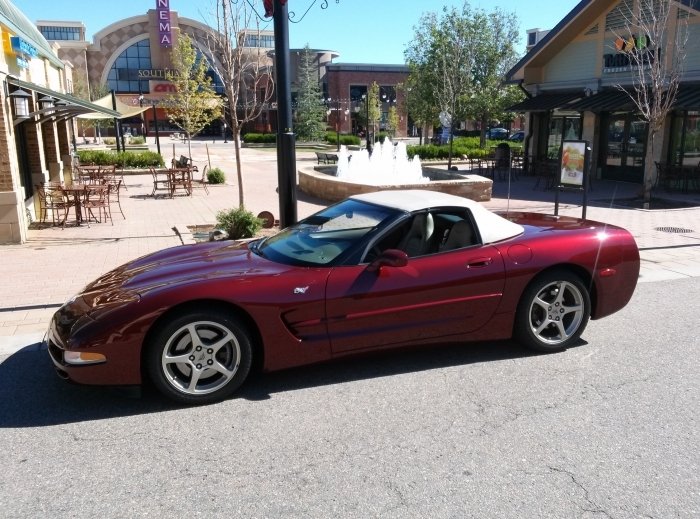 The RaggTopp kit was exactly what I needed to get the top on my 50th Anniversary C5 looking great again. The video was very helpful, and the process was simple. The brush did shed some of it's soft bristles during the scrubbing, but this was expected and not a problem; I simply brushed them off with a soft cloth after the top dried. Those bristles that were stubborn were gone after the first ride. I waited a day to spray the preservative on, just to be sure all the moisture was out of the top. Now the top looks as clean and sharp as the brilliant paint, and I get even more Oooos and Aaahhs when folks see the car. ProsEasy to use. Reasonably priced. Everything you need in one kit. Does everything what it promises. The cleaner seems like a good product but I was not pleased with the aerosol protectant. First off, they tell you to put on three coats but I only got a little over one coat on my Jaguar XK8 before the aerosol ran out. I also found that the aerosol does not work well pointed down, but most f the top is flat....duh. I found the aerosol spray pattern very erratic as well. Why does it need to be an aerosol? Will try 303 protectant next time. I also found the brush in this kit sheds a lot of brissles. these products are the absolute best for any premium cloth convertible top. should expand their distribution network so they are more available. i searched every automotive store in our area and no one stocked these products and most had never even heard of them. Very easy to use and make my top look beautiful.